Before I left for BlogHer, I introduced you to the Prepaid card with American Express. The American Express prepaid card allows you to budget but still have all the benefits of having a card that acts like a credit card in your wallet. As I said before, money burns a hole in my wallet. I swear I walk around and it just falls out in droves. It’s nice to have only a card – one that I’ve loaded, one that I can keep track of online, and one that I can budget with. It’s re-loadable too. This isn’t like having an Amex Gift card. You sign up for a card and you can load it time and time again with money via your bank account or cash online! 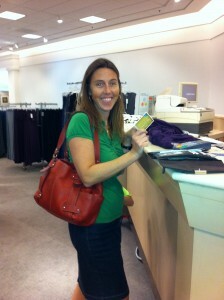 I used my card while I was at BlogHer and it was nice to not have to carry around a wad of cash. It works on big purchases – it worked at Starbucks when I bought a coffee for $4.31. Anyone can get an American Express Prepaid card. Find out more about it on their website. Disclaimer: American Express was one of my sponsors for BlogHer’11. They are providing me with compensation to use with the American Express Prepaid card.